Sail to Guadalupe Island for an unparalleled in-water experience with one of the world's most respected and enigmatic predators: the great white shark. Guadalupe Island is located in the Pacific Ocean off Mexico’s Baja Peninsula. With its clear blue water, subtropical temperatures, and an abundance of Great Whites, the protected waters surrounding Guadalupe Island is one of the absolute best places to observe and photograph these awe-inspiring animals. Depending on your comfort and skill level, watch sharks from the specially designed surface cages (no SCUBA certification necessary!) or take the plunge in the submersible deep-water cage for the ultimate experience 30ft below the surface. We welcome anyone interested in sharks regardless of diving experience. 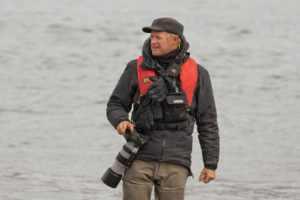 Scott Davis is the perfect leader for this unique adventure, having a background in marine biology and decades of field experience in photography. • Get up close and personal with the revered predator of the sea – the great white shark. 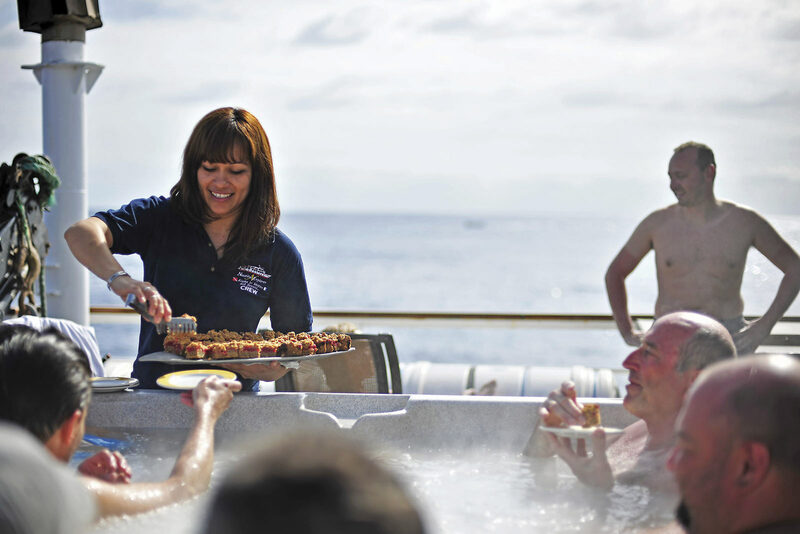 • Spend the week aboard the luxury vessel, Nautilus Explorer, with gourmet cuisine, and lavish accommodations. • If you are SCUBA certified, spend time in the deep-water cages observing sharks from a unique perspective. Arrive in San Diego. Transfer to the Best Western Plus Island Palms Hotel and Marina for a welcome reception with drinks and snacks. If you would like to arrive earlier, we can arrange your overnight at the Best Western Plus Island Palms Hotel and Marina. 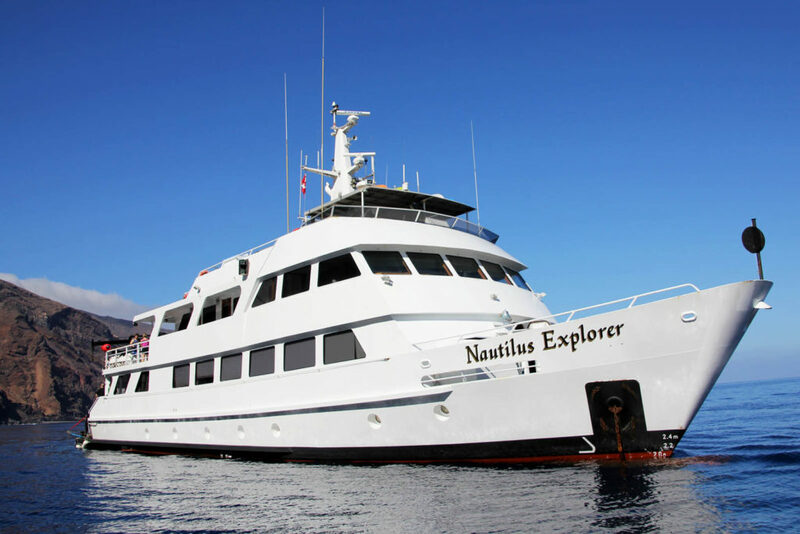 After the reception, you will travel by private bus to the dock in Ensenada, Mexico to board the Nautilus Explorer. Sail to Guadalupe Island and arrive around dinnertime. You can spend time on the deck searching for sea birds such as cormorants, boobies, and auklets along with occasional pods of dolphins or enjoy the ride indoors in the lounge or library. Guadalupe Island is a volcanic island with a rugged landscape located 180mi off the west coast of the Baja Peninsula and about 250mi southwest of Ensenada. It consists of two ancient overlapping shield volcanoes, the largest, Mount Augusta, rises to about 4,250ft in the north and the smaller, El Picacho, about 3,200ft in the south. The small island measures about 22mi by 6mi with a coastline of rocky bluffs and dense forest above. Spend three full days with great white sharks in your choice of surface cages or 30ft submersible cages. Cages are open from 6:30am to dusk, so you have the freedom to spend the day in the cages for as much or little time as you like. You can expect between 125ft and 150ft of water visibility enabling you to see sharks approach from beyond the anchor line through the clear, cobalt blue water. In the evenings after dinner, you can scan the shark identification catalogs to try to ID sharks you swam with that day. Guadalupe is considered one of the best spots in the world to see great white sharks, possibly because of its large population of pinnipeds. Many island or marine species that live near Guadalupe also frequent the Channel Islands. Guadalupe was the last refuge for the northern elephant seal and the Guadalupe fur seal in the 1890s. The island has been a pinniped sanctuary since 1975. You’ll spend most of the day at sea en route back to the mainland. Keep your eyes peeled for seabirds, bow riding dolphins, and maybe some whales. You’ll arrive in the Ensenada port in the afternoon and a private bus will transfer you back to San Diego airport or to the hotel if you are extending your stay. The 25-passenger 116ft Nautilus Explorer is the world's first and only fully SOLAS certified dive boat. This beautiful tough small ship carries the same certificates as the largest cruise ships in the world. She has a steel hull and superstructure, sea stabilizers, and sails at 12 knots maximum service speed. Equipped with two submersible cages and two surface cages, all with easy entry ladders, 12 passengers can be in the water at a time. Costs are per person depending on cabin type, single, double, or triple occupancy, not including airfare. See Included and Not Included sections for more details. Meals from breakfast on September 5 through lunch on September 9. Welcome reception with light snacks and drinks at the Best Western Plus Island Palms Hotel and Marina on September 4. Group transfer from the hotel to the Nautilus Explorer on September 4 and group transfer from the Nautilus Explorer to the San Diego Airport (or Best Western Plus Island Palms Hotel and Marina) on September 9. Five nights aboard the Nautilus Explorer. Non-alcoholic beverages while aboard the Nautilus Explorer. Port fee of $65 per person. DVD of photos and videos taken by crew while on board. Transfers from the San Diego Airport to the Best Western Plus Island Palms Hotel and Marina on September 4. Gratuities – tipping is, of course, discretionary, however we suggest budgeting about $200 to $300 total per participant for the ship crew. Rental gear (wetsuit, mask, booties, and diving gear). We will send you more details about rentals in the Trip Materials. Dive insurance, but it is required for you to purchase. For more information see our travel insurance webpage. Trip cancellation insurance. For more information see our travel insurance webpage. Items of a personal nature such as laundry, telephone calls, medical costs or hospitalization, room service, alcoholic beverages, items not on the regular menu, etc. If you have special dietary needs, please indicate them on your Reservation Form. September air temperatures range from 60–80°F (15–26°C) during the day and can drop to 45–55°F (7–12°C) at night. Water temperatures average 72°F (22°C). September is the tail end of the dry season for the Pacific Coast. Minimal fitness is required to join this shark safari, but your fitness and in-water ability enrich the experience. Getting in the water is not required; we’ve shared this safari with travelers who had wonderful experiences shark watching from the ship. To get the most out of this safari you should be comfortable in the water and getting in and out of the water via a ladder. We recommend you spend time swimming at a pool or similar before your trip to make sure you are comfortable in water. If you would like to use the 30ft deep sea cages, you must be SCUBA certified. Flights you (or a travel agent) book: Arrive in San Diego, California (SAN) no later than 5:00pm on September 4. Depart from San Diego, California (SAN) after 9:00pm on September 9. What are the shark cages like? The Nautilus Explorer has four shark cages. Two cages are submersible to 30ft and two remain at the surface. In both the submersible and surface cages, you will use a hookah breathing system with air coming directly from the boat’s compressor. Do not worry if you have never used hookah systems before, because we will demonstrate its use and a divemaster will be with you in the cage at all times. Do I have to be SCUBA certified for this safari? Is cage viewing safe for the sharks and people? Our goal is to keep our guests safe and also to protect our growing shark population. To that end, we teach and ask for responsible shark interactions that do not impact or change the behavior of these magnificent animals. We do not use oil, chum or blood. A piece of tuna, wrapped in a burlap sack, is all the sharks need to know we have arrived. We do not feed the sharks at any time. Conservation efforts continue at night when we kick back in the salon and identify who we spent the day with. And should you discover that you hung out with a great white shark not yet catalogued, yes, the naming rights are all yours. Don’t let a fear of seasickness scare you away! For all but the most sensitive, seasickness is rarely a problem in this region. It’s a good idea to bring medication if you get seasick or are unsure, but you may find that you do not need it after a couple days once you have your “sea legs.” Even those who have experienced seasickness reported that the incredible wildlife and overall experience were well worth the temporary discomfort. Read our online suggestions for coping with seasickness and contact us if you have any concerns. "Scott was awesome! He helped me so much with my photography and was always ready to answer questions. He is a great outgoing personality."